Malty and bready notes dominate this hat-tip to our Kansas farming tradition. Wheat character is dominant in this easy drinking beer that conjures memories of summertime fun. This easy drinking German beer isn’t your lawnmower beer. Why it’s malty grainy flavor and aroma is the perfect beer for a summer porch sitting day while our friends at Lawn Buddy mow the lawn! Bottom’s up as this is one you can enjoy all afternoon. Copious Centennial hops & Falconers Flight 7Cs hop blend pump up the hop volume of this beer to new heights. Private island and umbrella drink not included… This farmhouse-style saison has a healthy dose of fresh pineapple added to the fermenter to add a pleasant tropical flavor and aroma to the natural banana and clove produced by the special Saison yeast strain used in this ale. A hat tip to an award given out in our ownerâ€™s fraternity to a member who did something particularly awesome during the week. This cloudy, unfiltered wheat beer has hints of coriander and orange peel and is a refreshingly awesome beer to drink. Pro-Am collaboration created by Wichita Homebrew Organization President and homebrewer Alan Shafers, this light sour ale is brewed with rye, white wheat and Maris Otter malts and fermented with Lactobacillus and Brett Super Blend yeasts. Whirlpooled and dry hopped with Citra and Azacca hops. A beer conceived by one of our longtime regulars. This beer includes a healthy amount of rye malt, along with cinnamon and apple flavors, perfect for the holiday season. Made with Pilsen, Vienna, and Munich malts, this MÃ¤rzen style beer is a classic German fall favorite beer. Like many German style beers, malty sweetness makes this a pleasant, easy-drinking beer you can drink a little or a lot of. Prost! This MÃ¤rzen style specialty beer includes smoked malts that balance pleasantly with a decidedly malty backbone. Imagine the aromas of a lit fireplace or campfire while enjoying this one. This beer also pairs especially well with a good mild or medium cigar. Dry-hopped Bad Squirrel with an attitude! If you like Bad Squirrel, but wish it were hoppier, this might be your beer. This is an American porter for the adventurous. Lush waves of vanilla and hazelnut take drinkers to a very sensuous place. Don’t be fooled, this beer still drinks like it with pleasant balancing chocolate and roasted malts. Smooth and warming, this barleywine style ale is topped up to the brim with malty goodness. Served in our special Signature Series glassware, or upgrade to our 20oz size to go to your own maltster’s paradise. Augustino Brewing Company was founded with over 40 years of brewing expertise. Augustine “Stino” Iacopelli specializes in darker, malty, and roasty styles of beer. Geoff Finn specializes in European lagers and amber style beers. 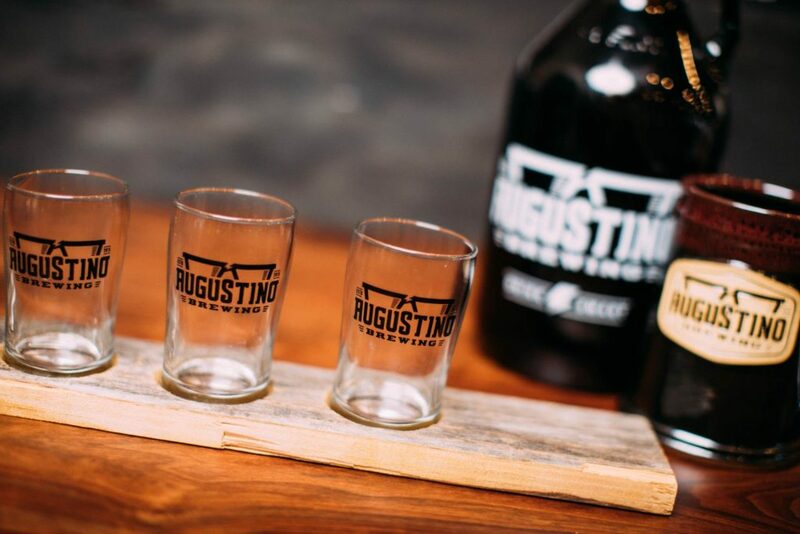 Together they team up to bring you an innovative and broad spectrum of flavors to choose from when you come to Augustino Brewing Company for your next craft beer outing. Check out our brewing schedule on our events page. It is a great opportunity to see us in action making the beer that you’re going to drink a few weeks later. Dropping by to talk to our brewers is also a great opportunity to find out more about our beers and our inspirations behind them. Even if the Brewers are not brewing when you are visiting, feel free to ask your bartender or server for a brewery tour. We are always happy to show off our goods and provide you with insider information on the brewing industry and our small part of it. Where possible, we try to integrate our beer ingredients as well as coffee ingredients together to provide you with an array of beers you might not experience anywhere else. Some of our past specialties have included our Java Latte Saison, a Saison style beer brewed with coffee beans. The lightest beer that we brew is our blonde ale. This is the perfect beer for a lighter beer drinker who generally drinks American domestic beers, but occasionally steps into the craft beer arena. On the opposite end of the spectrum is our Cold Case Imperial Coffee Stout. Bigger than any regular beer in the Wichita market, Cold Case packs a dark and roasty punch with a nice warming on the finish. Most drinkers will enjoy this beer the best during the winter months, however, we think this beer is good enough to serve year-round and is a great after dinner dessert beer. Another interesting beer on our flight is our Bad Squirrel Nut Brown Ale. There’s an interesting back story to Bad Squirrel, but you just have to drop by Augustino Brewing and ask one of our servers or bartenders to fill you in. Bad Squirrel is a great middle-of-the-road beer for those who want something a little bit more full-bodied, without a lot of hops and a nutty, carmelly flavor. Beyond the beers listed on this page, we are always seeking out new ideas and innovative one off beers. It’s really important to pay attention to our webpage and to our social media outlets to be on top of the very limited release beers that we do. Our limited releases come out once to twice a month and once they are gone, they are gone forever. The cool thing about our specialty beers is that there will always be a specialty food item to go with that beer. This is one of the cool ways Augustino Brewing Company sets itself apart from the competition. As our slogan says, you can always drink, but at Augustino Brewing Company you can Drink Smart.